Belgian Israel-basher Pierre Galand, a much respected (and this is surreal, also highly regarded by Belgian francophone Jewish leaders) and highly influencial socialist politician and 'humanist', has called for the boycott of Shimon Peres and accused him of being a "war criminal" who behind the façade of a "man of peace" is the representative of a "criminal State". On a previous occasion Mr Galand said that Israel was a rogue State. He also suggested that Yithzak Rabin was a war criminal. On the occasion of Peres' visit to Belgium, one of the anti-Israel associations he chairs (one of them is BDS) released a statement: "His dovish image serves to obscure the real face of this Israeli politician. Since 2007 as President of the State of Israel, he has used his positive image to help tone down the international negative reactions to the policies of the Israeli governments who lean more and more to the right". Pierre Galand also summoned "criminal" Shimon Peres to the last session of the Belgian kangaroo court he created (Russell Tribunal on Palestine) to be held next week in Brussels and to free Marwan Barghouti, hinting at Israel-apartheid. More on Mr Peres visit to Belgium: Belgian Jewish leaders invite head of anti-Israel university to debate with Shimon Peres. In French: Un ancien sénateur belge traite Shimon Peres de "criminel de guerre"
Belgian Jewish leaders invited the head of the Free University of Brussels to a debate which, unsurprisingly, turned out to be a disastrous "blame-Shimon-Peres-and-Israel-game". The audience was shocked by the violence of the charge. President Peres who was scheduled to answer questions, but left immediately after answering Mr Vivier's accusations. There are people in Belgium who hold positive views on Israel but they are ignored, why do Belgian Jewish leaders turn to Israel-bashers? Yet again, the debate was not about Israel. The debate was about the Israel-Arab conflict and the badness of Israel. The Free University of Brussels is a hotbed of anti-Israel sentiment and honestly the Rector who wascriticised for accepting the invitation to meet Peres had to be shown to be more than critical of Israel. The Russell Tribunal on Palestine was created by Pierre Galand and others from the ULB who called Shimon Peres a "war criminal" ("behind his facade of a man of peace he is a war criminal" and the "representative of a criminal State"). M. Peres praised the United States and President Obama. 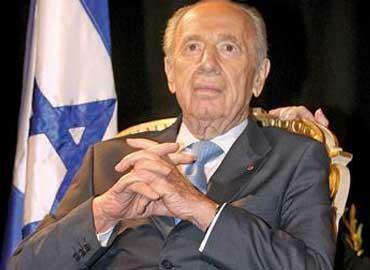 Well done Mr. Peres and sorry for the affront. Speaking on Tuesday at an event hosted by the umbrella representative groups of the Belgian Jewish community, the president Shimon Peres responded to "concerns" about the Israeli government’s policy expressed by the rector of the Brussels Free University (ULB), Didier Viviers, who was invited to debate with the Israeli leader in presence of ambassadors, academics, politicians and members of the Jewish community. 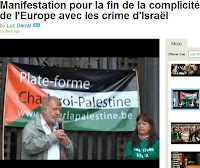 Viviers’s presence at the event had been sharply criticized by several fellow professors as well as by pro-Palestinian and extreme left pro-boycott activists who staged a demonstration in front of the Palais des Academies where the event took place. "I accepted the invitation to discuss with the president and to ask him a few questions as part of our freedom of speech," he said. "My university, Mister President, is concerned about violations of international law. The colonisation of the West Bank and East Jerusalem is illegal and violates the Geneva Convention," the rector told Peres. He also questioned the president's personal position on the issue and what he called the "double discourse." "While you are in favor of negotiations with the Palestinians on the issue, colonisation, which is the main obstacle, continues, even in East Jerusalem, a policy which is condemned by the Europeans," he said, before bluntly asking : "Mr President dont’you feel that you are used by Netanyahu and Lieberman." 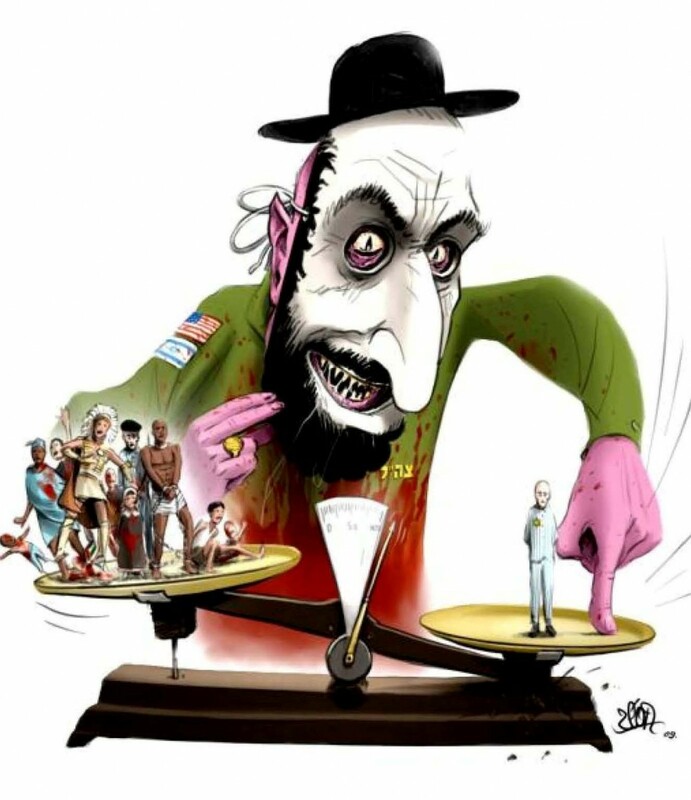 Europeans have been fed this type of desinformation on Israel for decades and against the Jews for centuries. These people seem furious that the wider public either does not believe them or doesn't care, hence their obsessive exercice of repeating and repeating the same accusations. Oh my, we can only hope the priest is capable of critical reading and thinking, as the Jewish participation Shatila incident he refers to in the text is a figment of the mentioned Palestinian’s fantasy… Also, if truly the policies against Palestinians is so cruel, so destructive, then how come the number of Palestinians is steadily growing? A mathematical mystery… More mysterious still, any mention of numerous attacks against Jews is plainly absent. It perhaps clutters the bigger picture the priest wants to paint? Palestinians are victims and Jews are monsters? Ivar Aartun, Norwegian priest, @Stavanger Aftenblad (translated by NI&J): Is Israel a terror State? Meanwhile a representative of the “Jew police” in USA travels to Malmö in order to investigate whether the Mayor has used anti-Semite terminology. But the “American Jew police” have no interest in the Jewish anti-Semitism in Israel. Billions of dollars are being transferred in support of brutal crimes and occupation. Without this support the Jews could not possibly have been building in the West Bank. Who is a Semite? To the Semite language groups, both Arab and Jewish peoples belong. Very many Palestinians are also of Jewish descent. They descend from the first Christian congregations in Israel (by the 7th century, all of the Middle East was Christian). Having this context in mind, Israel is perhaps the most anti-Semite country in the world. More mosques and churches are demolished in Israel than there are synagogues destroyed in Europe. But when Israel-Jews destroy the religious buildings in Israel they are referred to as hoodlums. When synagogues are destroyed in Europe, it is referred to as hatred of Jews. But both are anti-Semite! The old fashioned hatred of Jews disappeared post WW2. And well is that: But a new hatred of Jews has arrived because of the brutal Jewish suppression of the Palestinians. “I hate Jews”, a Palestinian–Scandinavian working in Norway said. “No, I hate Jewish politicians”, he corrected himself. He tells me: “We lived in the Shatila refugee camp in Beirut. One day we were surrounded by Israeli Jews. Their henchmen were sent into the camps. They raped the women, killed men, women and children in a ‘Jewish mini-Holocaust’ The Israeli Jews watched that no one got away. More than 1000 innocents were killed on that day. I lost all of my family”. No Israelis ever were held responsible over this brutal crime against the Palestinians. Are Norwegian Jews to blame over Israeli crimes against the Palestinians in Israel? Absolutely not. But the “Jewish collective” in the world, is through its statements and its political and economic support to Israel strongly implicated in the brutal anti-Semitism towards the Palestinians seen in Israel. Here in lies the cause of the new hatred of the Jews. In particular, the American Jews and their followers are strongly implicated. More HERE. On the Sabra and Shatila massacre read HERE. Of special note is this: "By contrast, few voices were raised in May 1985, when Muslim militiamen attacked the Shatila and Burj-el Barajneh Palestinian refugee camps. According to UN officials, 635 were killed and 2,500 wounded. During a two-year battle between the Syrian-backed Shiite Amal militia and the PLO, more than 2,000 people, including many civilians, were reportedly killed. No outcry was directed at the PLO or the Syrians and their allies over the slaughter. International reaction was also muted in October 1990 when Syrian forces overran Christian-controlled areas of Lebanon. In the eight-hour clash, 700 Christians were killed—the worst single battle of Lebanon’s Civil War. 10 These killings came on top of an estimated 95,000 deaths that had occurred during the civil war in Lebanon from 1975–1982." An anti-Semitic and holocaust-denying cartoon featured on posters for a conference in Brussels - in an area, Molenbeek, densely populated by Muslims - organised by the local section of the Socialist party. The conference was cancelled. The theme was "Let's talk calmly about Zionism"... You couldn't make it up, could you? Times of Israel: "Twelve experts of varying religions and homelands urged the US Congress to speak out against hate speech and anti-Semitism throughout the world, notably Europe. The human rights subcommittee of the US House Foreign Affairs Committee held a two-hour hearing on Wednesday in which experts testified that anti-Semitism is resurgent, particularly in Europe." It is indeed odd that David Meyer, a French rabbi who lives in Belgium and who is a relentless and harsh critic of Israel who advocates a bi-national State was invited as an "expert" on anti-Semitism to the United States Congress. Rabbi Meyer is more known for his criticism of Israel on the European media than for his fight against anti-Semitism. Pity that in his exposé before the Committee he didn't elaborate on his unbelievable views on Israel. In 2010, he gave an interview titled "It is more than time for Israel to wake up" to the French communist paper L'Humanité. This is how he was introduced: "Rabbi David Meyer holds dual French and Israeli citizenship. 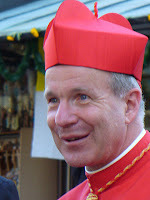 He is the author of several books and now lives in Belgium. He has been a committed militant for years and has unrelentlessly denounced the colonization [settlements] which he considers a fault on the part of the Israeli leadership. He has also been a critic of the blockade imposed by Tel Aviv [the capital of Israel!] on the Gaza Strip. He strongly condemns the attack against the peace flotilla off the strip of Palestinian land and calls on the Israeli leadership to "open their eyes" and to come out of their "messianic bubble". "What is your reaction to last week's tragic events [Turkish flotilla]? David Meyer: "I find them appalling. And I think that in such circumstances the role of religion is to show to those in one's own camp [the Jews] that they are no longer able to see [i.e. that they are blind]. There in the Jewish world and in Israel an inability to see what it means to put hundreds of thousands of people in prison for years just because they voted for Hamas. This is what Israel is doing in the Gaza strip. It is a sign of absolute failure of Israel vis-à-vis the Palestinian issue. This is very serious. Israeli leaders have no excuses, no mitigating circumstances. You do not kill civilians, especially when you are responsible for the situation created by the blockade. If the Jewish world does not wake up, nothing Jewish will be left in the State of Israel and it will of no interest. Jewish tradition teaches us that man must be able to surpass himself and see the human side even in his enemy and in the friend of his enemy. If the Jews of Israel are no longer capable of this, Israel will not survive. This is my fight and I am determined to continue." When asked about a European movement JCALL inspired by J Street, Meyer boasts that over the previous decade he has gone much further and said things much harsher about Israel than those contained in the "call" and that he "even said before the last election that one has to become a dissendent on the face of what the State of Israel is becoming. We must call a spade a spade and say that there are moral faults when creating an injustice that is not necessary for one's survival. The colonization [settlements] is not necessary. I signed the petition to express that while showing my commitment to Israel". 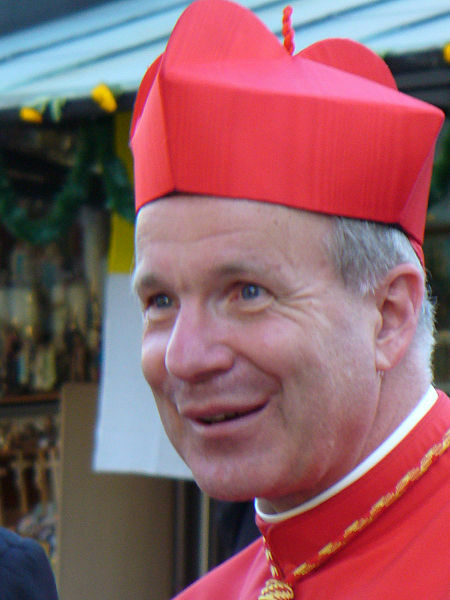 He complains that religion in Israel has "infected the secular world". And how will the future of Israel unfold? " I have always thought that long-term solution will be a federal and bi-national State, but it should go through a temporary phase of two States, Israel and Palestine. My model is Belgium, where we live together even if we do not like one other. Obviously, what is happening in Belgium is worrying, because if the federal model no longer works here, there is little change it will succeed there." He praises Jimmy Carter and criticises Barack Obama: "An outside power - the United States have the capacity - must force Israel out of its isolation and say, as Carter did in his time: "Enough is enough". I was hoping that Obama would do it, and I do not understand his procrastination." It is a pity that the Europeans have not done this type of research themselves. Even the famous tennis stadium Roland Garros in Paris was turned into a provisional camp for the detention of 'undesirable aliens'. 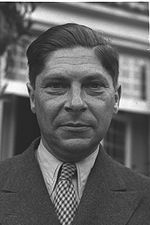 Arthur Koestler [photo] was detained there for a week with 500 other European 'undesirables' treated as the 'scum of the earth' and, according to Koestler, compared to other places of detention he experienced it "could almost be called pleasant": "Our grotto, or den, had no windows; our roof was the underside of one of the grandstands, ascending over us in a slope of 45 degrees; our bed was the concrete floor, with a thin layer of straw on it. The straw was damp, as the roof leaked at the junctures of the steps; only half of us had our own blankets and the camp did not provide any; and we lay so closely packed together that many preferred what we called the 'sardine system': head between the two neighbours' feet, in order to avoid mixing the breath." Scum of the Earth, Eland, p.p. 72-73. Thirteen years ago, researchers at the United States Holocaust Memorial Museum began the grim task of documenting all the ghettos, slave labor sites, concentration camps and killing factories that the Nazis set up throughout Europe. What they have found so far has shocked even scholars steeped in the history of the Holocaust. The researchers have cataloged some 42,500 Nazi ghettos and camps throughout Europe, spanning German-controlled areas from France to Russia and Germany itself, during Hitler’s reign of brutality from 1933 to 1945.The figure is so staggering that even fellow Holocaust scholars had to make sure they had heard it correctly when the lead researchers previewed their findings at an academic forum in late January at the German Historical Institute in Washington. See also: Beppe Grillo called Nobel Prize winner Rita Levi-Montalcini an "old whore"
Beppe Grillo, the comedian turned politician, has just become the leader of Italy's largest party, the "Five Star Movement" in an upset victory. This populist Europhobe got one fourth of the popular votes. He is the idol of Italy's youth. He is the anti-corruption crusader. He is the guru of the Internet. Mr. Grillo does not hesitate to say that “talk of Israel is a taboo, as is talk of the euro. 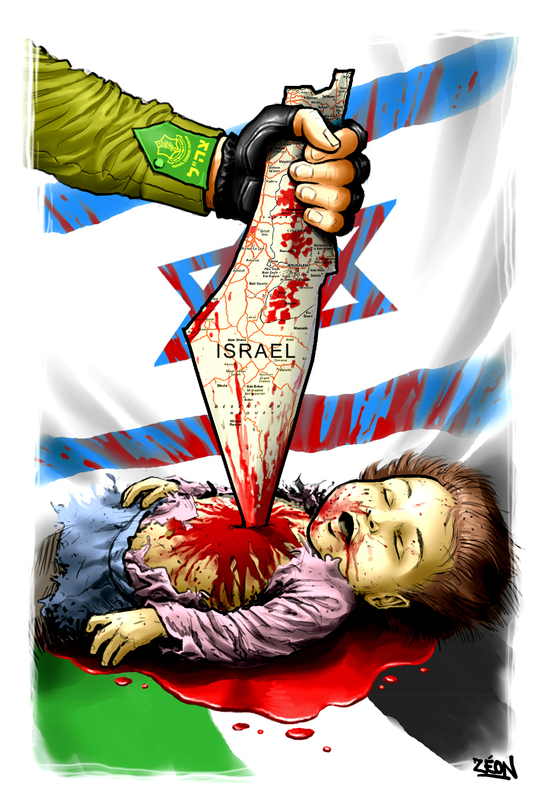 Just touch it, they will tell you that you are racist and anti-Zionist”. He declared that “all that in Europe we know about Israel and Palestine, is filtered by an international agency called Memri. And behind Memri, there is a former Mossad agent. I have the evidence: Ken Livingstone, the former Mayor of London, has used Arabic texts with independent translations and he discovered a completely different reality". Then he goes on, alluding specifically to a 'Jewish conspiracy' and the need to "check" all information on the Middle East. Grillo also said that his Iranian father-in-law explained to him that “the translations were not accurate …”, referring to Mahmoud Ahmadinejad’s expressed desire to erase Israel from the map. According to Grillo, Ahmadinejad’s regime is not like the one described by the Western media: "Those who escape, are opposed to it. But those who remained do not have the same concerns that we have abroad. The economy there is okay, people work. It’s like South America: before it was much worse. I have a cousin who builds highways in Iran". On the executions ordered by Ahmadinejad: "One day I saw a person hanged on a square of Isfahan. I was there. I asked: what is this barbarity? But then I thought of the United States. They too have the death penalty: they put one on a diet, before killing him, because his head is not shrinking. And then: what is more cruel?". Erdogan's 'Alliance of Civilisations' idea: Zionism is a "crime against humanity"
VIENNA (EJP)--- Turkish Prime Minister Recep Tayyip Erdogan [...] told the Global Forum of the UN Alliance of Civilizations (a forum initiated by... Spain) in Vienna that Zionism constitutes a “crime against humanity”. In an address in Vienna's Hofburg Palace to the fifth meeting of the forum Turkey co-initiated with Spain to "galvanize international action against extremism through the forging of international, intercultural and interreligious dialogue, Erdogan said that whilst “we should be striving to better understand the culture and beliefs of others, instead we see that people act based on prejudice and exclude others and despise them”.